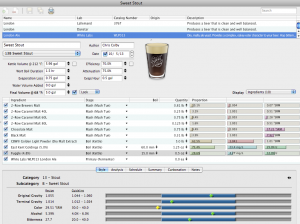 A screen shot from BeerTools Pro of a sweet stout. A full-bodied beer, used as an example of lowering the fermentability of an extract wort. This formulation uses a partial mash for the best aroma and flavor. But the partial mash wort is brought to a boil first, before adding malt extract. The addition of lactose and a reasonably large amount of crystal malts yield a higher FG than usual for this OG. A full-bodied, sweet-tasting stout with a nice, chocolate-y flavor. Make yeast starter 2 to 3 days ahed of time. Place crushed grains in a steeping bag and steep (mash) the grains at 154 °F in 4.5 qts. of water in your brewpot. Mash for 45 minutes, heating occasionally to maintain temperature and swirling bag to increase extract efficiency. In a second pot, heat 2.3 qts. water to 170 °F. In a third pot, heat as much water as you manage, up to 2.0 gallons, up to a boil. Begin heating brewpot to a boil, leaving grain bag submerged. When you reach 170 °F, remove grain bag and place in colander over brewpot. Rinse grains with 170 °F water and continue heating wort. Add boiling water from third pot (and any extra tap water you need) to bring brewpot volume to at least 3.0 gallons. Bring wort to a boil, then add roughly half of your malt extract. Boil for 60 minutes, adding hops at times indicated. Dissolve lactose and remaining malt extract in wort and stir into wort in the final 15 minutes of the boil. Cool wort and transfer to fermenter. Top up to 5.0 gallons and aerate well. Pitch sediment from yeast starter and ferment at 70 °F. Bottle with corn sugar or keg and force carbonate to 2.4 volumes of CO2. Make yeast starter 2 to 3 days ahead of time. Place crushed grains in a steeping bag and steep (mash) the grains at 68 °C in 4.3 L of water in your brewpot. Mash for 45 minutes, heating occasionally to maintain temperature and swirling bag occasionally to increase extract efficiency. In a second pot, heat 2.1 L water to 77 °C. In a third pot, heat as much water as you manage, up to 7.6 L, up to a boil. Begin heating brewpot to a boil, leaving grain bag submerged. When you reach 77 °C, remove grain bag and place in colander over brewpot. Rinse grains with 77 °C water and continue heating wort. Add boiling water from third pot (and any extra tap water you need) to bring brewpot volume to at least 11 L. Bring wort to a boil, then add roughly half of your malt extract. Boil for 60 minutes, adding hops at times indicated. Dissolve lactose and remaining malt extract in wort and stir into wort in the final 15 minutes of the boil. Cool wort and transfer to fermenter. Top up to 19 L and aerate well. Pitch sediment from yeast starter and ferment at 21 °C. Bottle with corn sugar or keg and force carbonate to 2.4 volumes of CO2. I wonder if is possible to brew this recipe in small batches (4 L), what do you think? 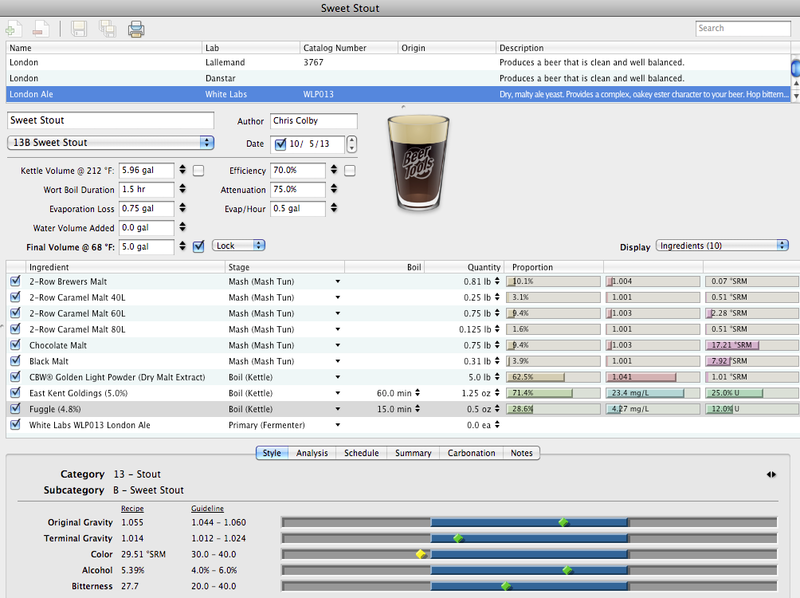 Sure, any beer recipe can be scaled up or down. Within the span of volumes that homebrewers would brew, you can scale most recipes linearly.